Another day, another dollar. I just returned from another tradeshow, Surf Expo in Orlando, FL. This is a retailer buying show much like Outdoor Retailer that I reported about a few weeks ago for my job at Sierra Trading Post. 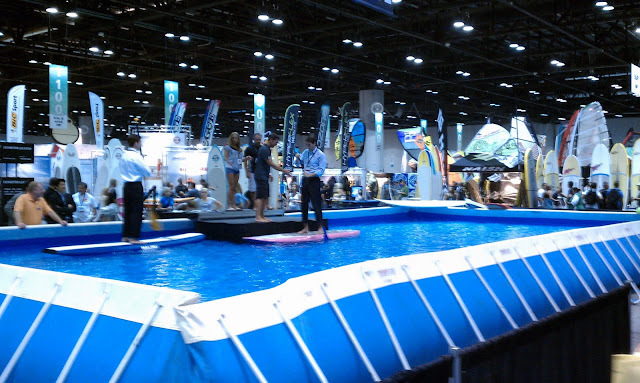 Surf Expo incorporates everything in the watersports recreation industry. The show had everything on display from touristy souvenirs and resort swimwear to wakeboards and stand up paddle boards. The show is a fraction of the size of OR, but still boasts filling the main hall of the Orange County Convention Center! My main goals for attending Surf Expo were to touch base with the vendors we already work with and prospect for new vendors and relationships in the wake, skate, surf and lifestyle clothing categories. Overall the show was a success and there is much work to be done in the office now to close deals and order new product. Connelly and O'Brien are two of our larger watersports brands, they makeup the bulk of our hardgoods offerings. Tube towables, wakeboards, tow ropes, etc. 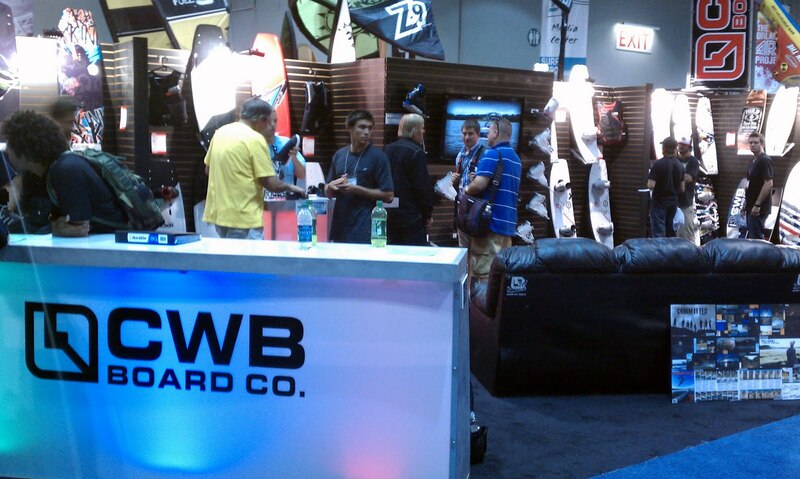 are all hardgoods that we offer our customers and I saw plenty of innovative designs at the show. They are implementing rocker and new fin combinations to make carving easier and allow for softer landings. 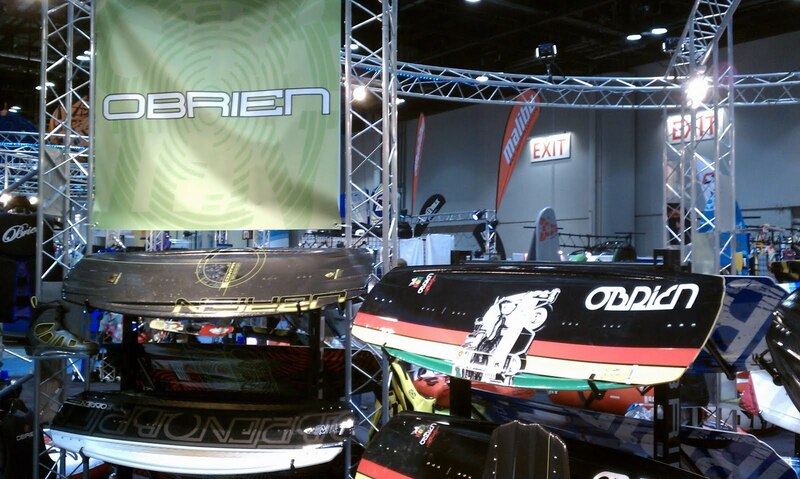 Connelly and O'Brien are both front runners when it comes to high end wakeboards and innovative towable tube designs. Both of their factory sponsored teams throw down sick tricks at competitions to earn high praise for both themselves and the brands they represent. These competitions take place on lakes and in cable parks. Cable parks are basically small man made lakes or ponds that have cable systems running around and across the water. These cables pull tow ropes around the park and wakeboarders can grab on and make their runs. Think of a ski resort terrain park and then picture cables running around. Same idea. These competitions even take place indoors at expos and tradeshows like Surf Expo. Check out the video below of one such competition at Surf Expo. 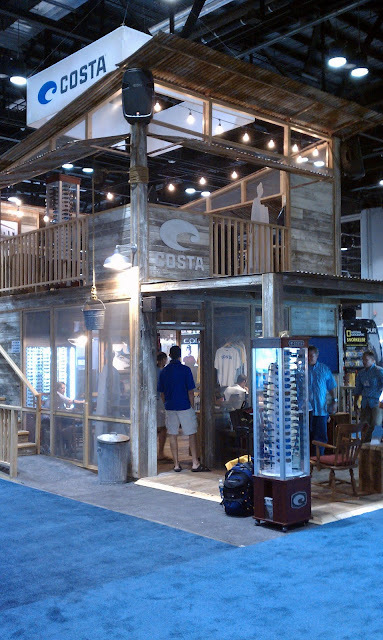 While the wake and lifestyle apparel brands were the main focus of the show there were optics, surf and stand up paddle brands all represented at Surf Expo. I met with our contacts at both Native and Costa Del Mar just to touch base and say hello. I also swung by Fox Optics and Von Zipper to see if there would be opportunities to work with them as well. While it was good to see old friends and check out some new optics brands there are a couple categories that STP has nothing to do with...yet. These both include surf hardgoods and stand up paddle. After contacting SurfTech and other surf brands and talking to SUP Love and other SUP brands I am confident that there are opportunities for STP to start working in these categories. At STP we have always tried to predict market trends and react to our vendor's needs when it comes to moving excess inventory. We always strive to focus on our customers wants and their overall interests and we believe that these surf, wake and lifestyle brands will all build STP as a company and grow our customer base and customer loyalty. We have always had the best brands at the best prices, in every category, and always will. Guys in suits on SUP's. Gotta love Surf Expo. These surf, skate and paddle categories are all growth categories for Sierra Trading Post and I have been working especially hard to bring some new brands to our customers. In the wake hardgoods category I have been focusing on pulling in brands like Hyperlite and Liquid Force and had many meetings with a number of different brands. I met with Sales Managers and Vice Presidents while on this trip and every conversation was promising. Whether it was sitting down with Von Zipper and looking at opportunities for sunglasses and goggles or lifestyle apparel from RVCA and Vans, the trip went very well. Some new brands that have started with STP include O'Neill and we have product that will be going up for sale soon. We are hoping to have other brands including Billabong and Hurley up soon as well. Stay tuned to Sierra Trading Post as new categories and fresh product crop up.